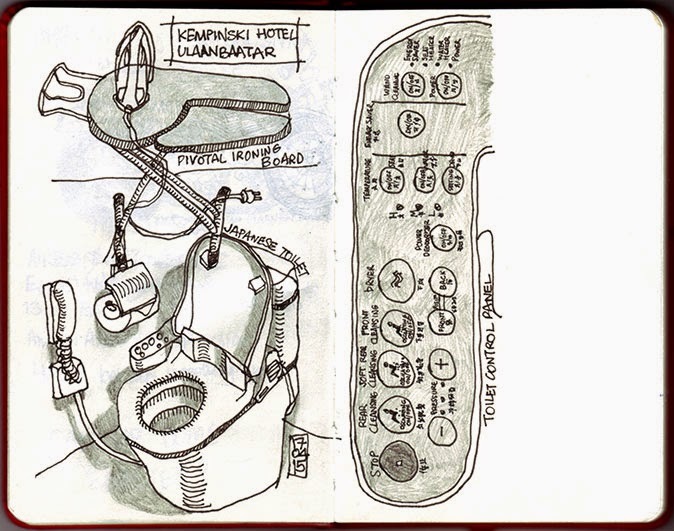 With work over for the week, I had about an hour to sketch a couple of the items in the hotel room. The first was the ironing board which had a front section that pivoted to form what looked like two legs - utterly brilliant for ironing sleeves and trouser legs. Why don’t all hotels have this? The second was the Japanese toilet. I have encountered these on previous trips, but this one seemed to have more settings for rear cleansing, soft rear cleansing, front cleansing, drying, power deodorising, wand cleaning (not what I first thought) and various temperature, pressure and comfort settings. The last Mongolian dish of the week was ‘banshtai tsai’, or dumplings in milk tea. A photograph did not do the meal justice as the dumplings were mostly hidden by a sea of salty tea, which tasted like a weak cream soup. It was very pleasant and, thankfully, not as substantial as previous meals. For more information on Mongolian food, try the series of five short programmes by American food writer Andrew Zimmern on YouTube, starting here.